The best way to get to know a community is by scheduling a tour. 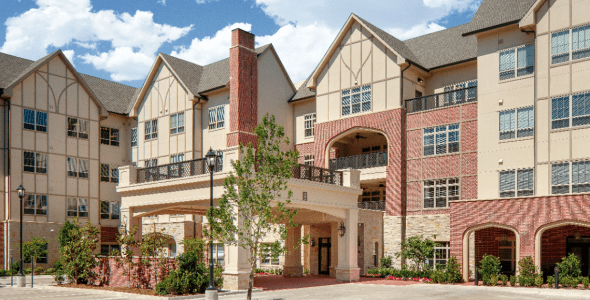 See the facilities, meet the staff and residents, and get a feel first hand what it's like to live at The Tradition - Prestonwood Assisted Living. It’s like an ocean cruise, only better. It’s home. Savor a morning swim, enjoy billiards or an art class in the afternoon and hear a piano concert right before dinner and dancing – all in the same place. No, it’s not a cruise ship. It’s life at The Tradition-Prestonwood, Dallas senior living at its best. Stimulating programs are for the taking each day. State-of-the-art amenities, beautiful interiors, and impeccable service combine for unparalleled value. Surround yourself with a world of beauty, which is just the beginning of Tradition’s Assisted Living Communities. Informative and interesting activities that focus on wellness beckon daily; our restaurant-style dining offers an exquisite, ever-changing menu; our cutting-edge technology – truly unsurpassed – promotes safety and proactive care for each resident. And finally, a superbly trained staff provides graciousness and hospitality throughout each day. A beautiful and nurturing environment surrounds residents at Tradition’s Memory Care Communities. We work carefully with family members of residents suffering from Alzheimers or dementia, developing a customized care plan before any resident moves in. Our cutting-edge technology – truly unsurpassed – promotes safety and proactive care for your loved one. And finally, a superbly trained staff provides graciousness and hospitality throughout each day.